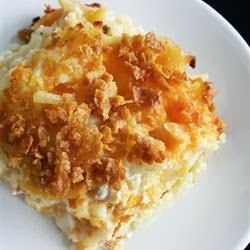 Mix hash brown potatoes, sour cream, onion, cream of chicken soup, Colby cheese, and melted butter in a bowl; season to taste with salt and black pepper. Transfer mixture into a 9x13-inch baking dish and sprinkle top with corn flake crumbs. Bake in the preheated oven until the casserole is bubbling, about 1 hour.